Darjeeling: The Indian Railways will give impetus to steam services of the world heritage Darjeeling Himalayan Railways (DHR). Ashwini Lohani, Chairman, Railway Board on a one-day tour of the DHR, talking to media persons in Darjeeling stated: "The steam service of the DHR is it's forte. There are 14 steam locos out of which 7 are operational. We will ensure that the other 7 become operational as well." Stress will be given on steam locos charter from NJP to Darjeeling. "After all the steam locos become operational, we will run steam services on the NJP-Darjeeling stretch once or twice a week," added the Chairman. At present, diesel locos run on the Darjeeling-NJP stretch with steam locos hauling joy rides on the Darjeeling-Ghoom stretch. The rolling stock, stations and sheds will be kept in the top condition. Senior supervisors of DHR will be sent for foreign training to make them aware of the superior standards practiced in maintenance and operations of narrow gauge services abroad. Air brake systems of steam engines will be modified for more efficiency. "2 rail buses will be built at the Tindharia workshop and will be operational from NJP to Darjeeling in the next 6 months," stated Lohani. Both Ghayabari and Sonada stations that was torched during the agitation will be rebuilt by end of September. First class coaches on the NJP Darjeeling route will be replaced by AC coaches shortly. He even assured that he will look into the possibility of reduction of fares in the narrow gauge services and also introduce 2nd class coaches in joy rides to make it more accessible to the general public. The Indian Railways will give impetus to steam services of the world heritage Darjeeling Himalayan Railways (DHR). 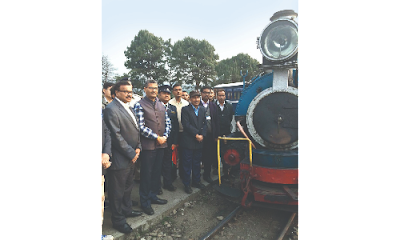 Ashwini Lohani, Chairman, Railway Board on a one-day tour of the DHR, talking to media persons in Darjeeling stated: "The steam service of the DHR is it's forte.